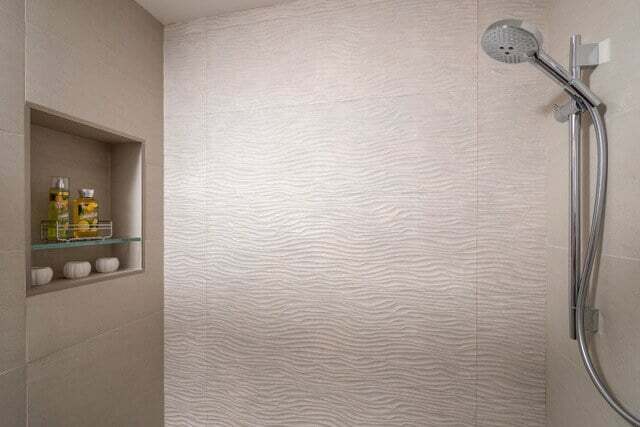 By far, the most popular surface for shower walls is tile. 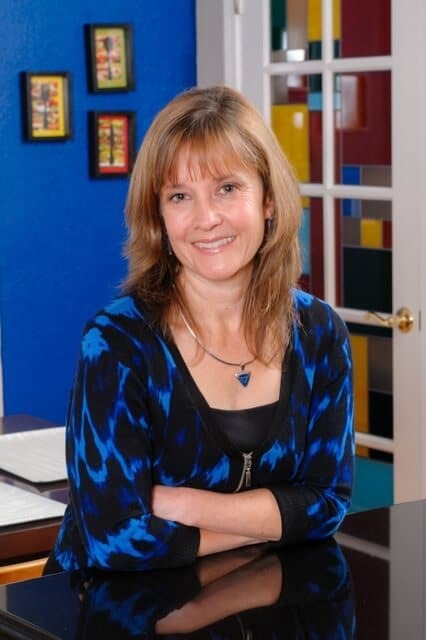 In the world of tile there are literally thousands of options—from natural stone, to ceramic, to glass, to porcelain. Regardless of the look you are aiming for, there is a tile out there that will fit the bill. However, some tiles are definitely more high maintenance than others. One example is marble. Marble tile is gorgeous, and I wouldn’t tell you to never use it in a bathroom, but if you do, you need to be aware that it must be sealed periodically, and that it can stain. Fortunately, however, there are some high-quality porcelain tiles that look very much like real marble. No sealing required, and no staining either. With any tile, it’s really the grout that needs the most attention. To minimize the amount of grout in the shower, select large tiles— 12” x 24” tiles are a very popular size— and install them using the smallest grout line possible. Many tiles now are coming in very large sizes- like the 36” wavy tiles shown in the photo below. Using large tiles gives the shower walls a very sleek look, and can actually make a small shower look larger. The large tile is almost like using a solid surface material, which I will discuss shortly. Plan to seal your grout periodically; in a heavily-used bath, once a year is advisable. In occasionally-used baths, every few years is probably sufficient. Probably the best thing you can do, however, is what I tell my clients all the time: Make friends with the squeegee! Keeping water from sitting too long on the tile or the grout makes all the difference. Take 60 seconds after each shower and use that squeegee on the walls (don’t forget the shower doors!) I’m not kidding when I say that this step will save you lots of cleaning time. One design trick I’ve started using in some of my bath projects is using tiles on the large wall of the shower only, and solid surface material on the two side walls. This is a great idea from both a stylistic perspective and a cleaning perspective. In the photo, for example, the only tiles used are the large navy blue ones on the center wall. The two side walls are full-height white solid quartz slab. 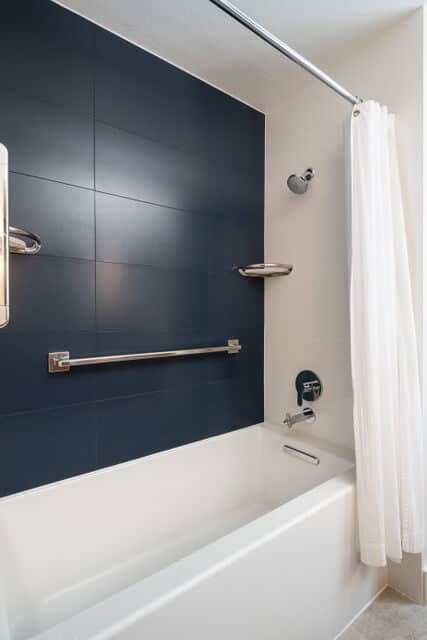 The matching navy blue grout lines are minimal in size (1/8”) and easy to clean. The dark tiles make a bold statement in the room, while the gleaming white quartz keeps the space looking light and bright. 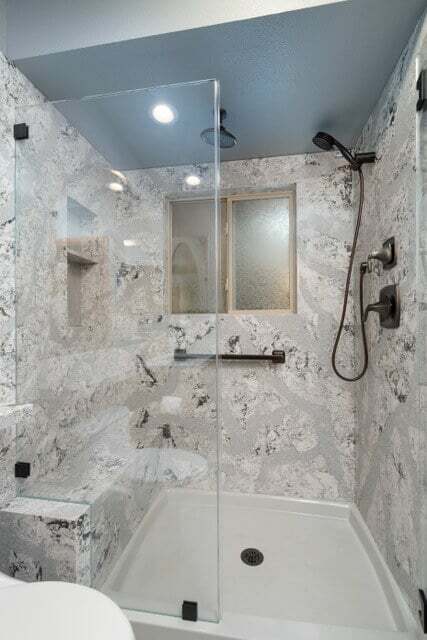 Another option, if you want no grout at all, is to use quartz slabs on all the walls of the shower. Quartz is non-porous, which means no sealing and no staining. And with the myriad choices available, you are sure to find a look you like. More and more beautiful colors and patterns are being introduced all the time, which means you can have walls with beautiful granite-like patterns, as in the photo, or walls resembling concrete, marble, and limestone. For folks wanting a bold punch of color, quartz also comes in very vibrant hues like fire engine red, cobalt blue, and lime green. For one wall or all the walls, using solid surface materials in the shower will increase style and reduce cleaning time. “How can I have a bathroom that’s beautiful but still easy to clean?” This question comes up frequently when I speak with clients about their bath projects. The good news is that there are solutions!